A video posted to Facebook this morning showed the aftermath of a three-vehicle collision on Route 158 in Joliette, 80 km northeast of Montreal. The video, posted by Dave Landry just after 11 am, shows billowing and dark smoke rising from a truck engulfed in flames. 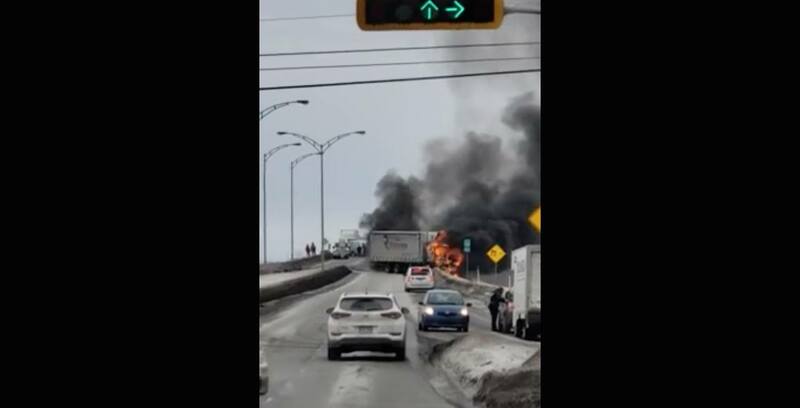 Quebec 511 confirmed in a tweet that the three-vehicle collision set two cars ablaze and that boulevard de l’Industrie was closed down as a result. Police stopped traffic in both directions and the site was cleaned up while an investigation was conducted. 511 has yet to confirm the cause of the crash and didn’t announce if anyone was injured or not. The video of the aftermath of the collision can be found here.